Reinhardt, in conjunction with R.M. Moore Elementary School, the University’s Partner in Education, collected gifts for local families as part of the University’s annual Giving Tree. University faculty, staff and students donated more than 64 gifts ranging from clothes and shoes, to dolls, games and toys. The gifts were presented to 15 local children, ages 2-12 years old from 9 families in the community. I am happy to report that we had another successful year with the Giving Tree project, said Janna Moore, executive administrative assistant to the Vice President for University Advancement. I am so grateful to the Reinhardt Family for their participation. It really puts you in the holiday spirit knowing you are helping to give children in the community a wonderful Christmas that they might not have otherwise. 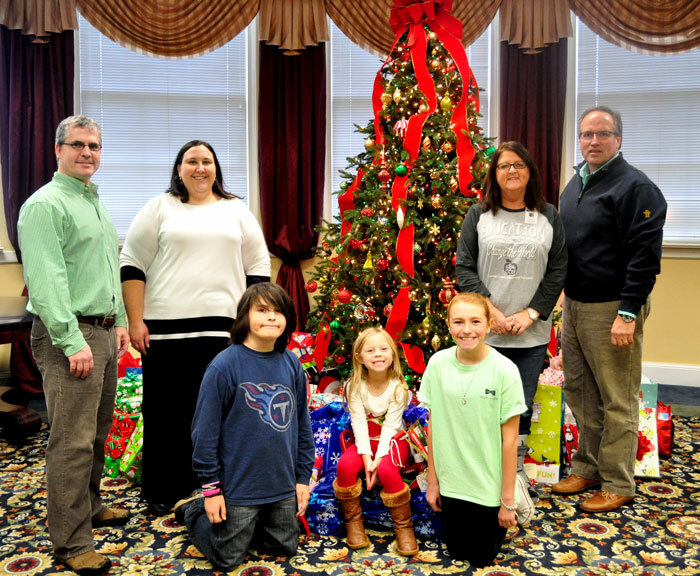 Giving Tree organizers and school representatives included (from left): Mr. Jon Costales, Counselor, Janna Moore, Quin Costales, 5th Grade, Emma Kate Townsend, Pre-K, Juliana Brown, 5th Grade, Dottie Townsend, RM Moore Secretary, and Tim Norton, VP of Advancement and Marketing.